(Left to Right) Keynote Speaker Heather Reid OBE, ng homes Head of Regeneration Margaret Fraser, Founder of Dekko Comics Rossie Stone and Keep Scotland Beautiful Charity Trustee Tom Brock OBE with the ng homes award. 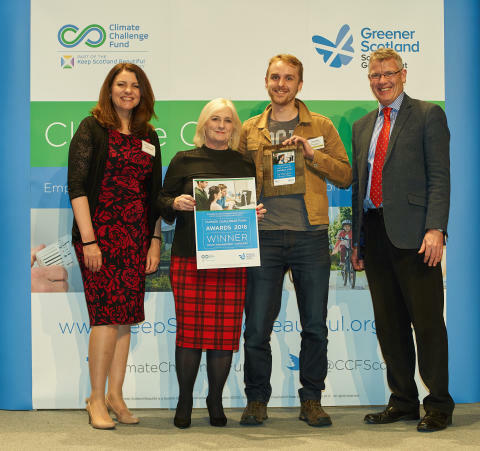 ng homes was delighted to receive the Award for Youth Engagement at the recent Climate Challenge Award ceremony held in Perth on Wednesday 12 December. Young people and families in North Glasgow have taken on the challenges of Climate Change focussing on areas of waste, recycling and re-use, and energy. ng homes’ Climate Challenge project – ‘Embedding North Glasgow’s Green Legacy’ works across the North Glasgow community and operates a variety of projects including the following: a furniture and food recycling project and local redistribution centre, a pop-up community swap shop, and upcycling and energy efficiency activities. The Young Green Champions group was formed with the young people investigating their eco issues and looking at creative ways to get the message across. One of their activities included fun and creative workshops with Rossie Stone, Founder of Dekko Comics. Margaret Fraser, Head of Regeneration said: "The young people got really involved in the whole process. The idea of creating their own comic book was really exciting and they came up with their own drawings and designs and explored concepts around the ‘Blue Planet’ programme that highlighted the impact of plastics and other items in the oceans. We are delighted with the results." The result of their workshops was a fantastic colourful comic book with really important messages that has been distributed to local schools. The ‘Young Green Champions Comic Book’ was launched by the young people at a large celebration event at Keppoch Campus on Monday 10th September supported by their parents and other older members of the community who also had their ideas included in the Comic Book. The project allowed those taking part to be imaginative and resourceful. The Climate Challenge Fund Awards Panel commented: “The Awards Panel were impressed by the combination of ways this project worked with and involved young people, giving them a forum to learn more about climate change and to develop creative ways to help tackle it”. “Visual entertainment has so much potential not only to grab the attention of young readers, but get them involved too. It's been a wonderful experience working with the children of the North Glasgow community on this project." “ng homes is delighted to receive this important award. We are committed to working on issues of Climate Change and we applaud the wonderful work of these young people and others who have contributed to this comic strip. This creative approach really gets the message across. We look forward to seeing them and other young people continuing with this important work”. You can also access the Keep Scotland Beautiful Climate Challenge Fund’s national news release here. Our vision is to build a community where people can flourish and prosper.